Wow, nice work. Its always good to see older electros getting some attention. I like it a lot! Looks like you took you're time and made a very nice marker. im not a big imp fan, but that is one nice looking imp! nice job. Sweet looks like a space age gun!! Like it a lot. Xaverian Football: only play with the best!! yea i like that X looking shape on the sides of the marker that thing is sweet. And it is very nice to see older guns get some attention especially imps cause everyone says imps blow arse. but looks to me like you completely destroyed that theroy with this gun setup. keep up the good work. very nice marker. 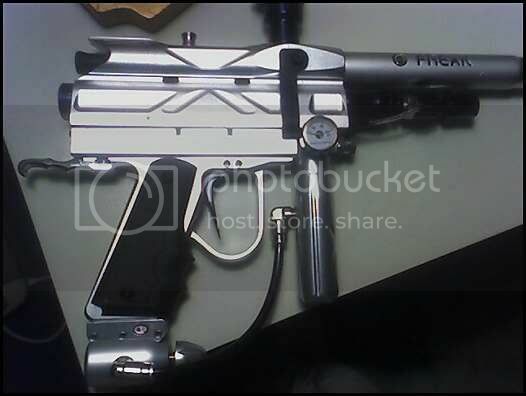 its a nasty x imp, the x is nasty's signature to the gun, there is one on the front of the maxflow as well. yea i kno thats why i like it. it goes well with all the other parts. Looks good man, Keep up the work and enjoy! I like videos.. Even if it's a tippmann. haha.